What is Non-Member & Good Sam Club Pricing? At Overton's, we make every effort to offer the best products at the best value. In addition to our competitive pricing, we offer exclusive savings for Good Sam Club Members. Simply look for items denoted as Members-Only Specials within the "Deals" drop-down menu. Good Sam Club Members also receive early access to our Overton's sales & promotions, Double Discount Days, members-only specials, free shipping offers and much more! Simply add your Good Sam Club membership number to your cart and start receiving the benefits of additional savings and coupons today. Click here for more details. When can I cancel or modify my order? We try to ship your order as quickly as possible, so once your order has been processed we are no longer able to cancel or modify it. If necessary your order may be returned or exchanged. Please see our Easy Returns for more information. Once your order ships, we will email you all available tracking information. You may also use Track My Order. We are also available every day from 8am-11pm ET to answer any questions you may have regarding your order or shipment. Contact us at 1-800-334-6541. I ordered several items, why did they arrive in multiple shipments? We make every effort to ship your items together; however, there are times when we may have to divide your order into multiple shipments. Please note that when an order is divided into multiple shipments, you are not charged an additional fee. An item is backordered when it is out of stock in our warehouse and is awaiting replenishment. There are times when an item may sell better than expected, and although we do our best to keep everything in stock at all times, delays can happen. Why doesn't my order qualify for a promotion? We're sorry for any trouble experienced during checkout regarding promotional offers. There may be some requirements not met for the special offer. Some vendors choose not to participate so we must honor our agreement. There are some categories that are excluded from promotions. See details. What are my payment options when placing an order? Shopping at overtons.com is easy and safe! Money orders and checks can be mailed in for orders placed over the phone or using the catalog. What states charge sales tax? We apologize if your order arrives in less than perfect condition. For items that arrive damaged, immediately contact our customer service team at 1-800-334-6541 for further instructions. Our hours are 8am-11pm ET. Please keep all boxes and packing materials until informed otherwise. The flat rate shipping and handling charges listed above are for shipments to the contiguous United States only via FedEx SmartPost with final delivery by the U.S. Postal Service. All delivery times are quoted in business days, not including weekends and holidays. Certain items may require additional shipping charges, and some items can only be shipped by truck service. Hazardous merchandise cannot be shipped by air express service. A hazardous shipping charge may be applied for specified items. Overton's reserves the right to limit quantities and/or charge actual shipping charges on bulk orders. For shipments to the continental United States only. If the merchandise on your order totals $49 or more for Good Sam Club members or $99 for non-members, your Standard Ground Shipping is FREE. If the merchandise on your order is less than $49 for Good Sam Club members or $99 for non-members, your Standard Ground shipping charge will be just $5.99. Gift card purchases do not count toward the minimum requirement for free shipping; however, gift cards always ship for free. Most orders ship within 24 hours and will arrive in 3 to 7 business days via FedEx SmartPost with final delivery by the U.S. Postal Service. Free shipping excludes shipments to Alaska, Hawaii, U.S. Territories, Canada, and international addresses. Most orders ship within 24 hours and will arrive in 2-5 business days from time of shipment via FedEx or Priority Mail. 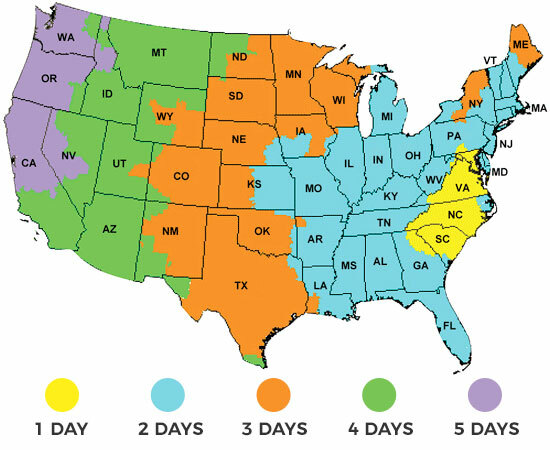 Please see the chart below for estimated delivery times to your area. Items that ship by truck service or are shipped directly from the manufacturer may not qualify for expedited ground shipping. In-stock phone and web orders placed before 2pm ET will ship the same day and arrive the 2nd or next business day. The flat-rate 2nd Day and Next Day shipping charges listed under Shipping and Handling are for most 1-20 lb. orders. Orders over 20 lbs. will be charged actual shipping charges that will be calculated during checkout. We do not refund 2nd day or Next Day charges unless Overton's has made an error. Certain items may not qualify for air express shipping. This service does not include Saturday delivery; please contact customer service at 1-800-334-6541 (8am-11pm ET) for Saturday delivery rates and availability. These areas require a special handling fee of $10 plus actual shipping charges based on the weight and dimensions of the package(s). Charges will be calculated during checkout. For Canadian and International customers, the shipping charge at checkout is an estimate; you will be contacted by our International department with an exact quote once the order has been submitted. Any applicable duties, taxes, customs charges, and brokerage fees are the responsibility of the customer. To track your shipment, select the link in your shipping confirmation email to monitor progress while in transit. You may also call 1-800-334-6541 or email us; our hours are 8am-11pm ET. If the order is large and shipped in more than one box, your packages may arrive separately. Anyone intending to export or re-export an item after receipt from Overton's, Gander Outdoors, or Gander Direct Marketing Services is solely responsible for obtaining all necessary licenses and for filing the export in accordance with any and all applicable U.S. federal, state, and local laws as well as any other governing law. Diversion contrary to U.S. law is prohibited. Certain items may be prohibited from being exported from the United States. Certain items may be prohibited from being imported into certain localities, states, and/or countries. Overton's is not liable for violations of any such laws. We believe in offering the very best value, quality, and selection. Plus, we want you to enjoy your purchase! In the event you wish to send a product back to us, you may return unused items for a refund or exchange, minus shipping, within 90 days from the date of purchase unless noted below under exceptions and exclusions. For web orders, please contact our customer service team (1-800-334-6541) to ensure your return or exchange is documented and any potential questions have been answered. In most cases, a return authorization will be provided and, in every case, we’ll begin to keep an eye out for your return. For retail purchases returned with a receipt, please return the unused and unopened item, with the original sales receipt, for a full refund or exchange. All returns with a gift receipt will receive a store credit for the amount of the item at the time of purchase. For retail purchases returned without a receipt, the refund will be issued as a store merchandise credit at the lowest price within the last 90 days. Proper ID will be required in the form of a valid, state-issued driver’s license or state ID card. We reserve the right to limit or refuse returns without a receipt. For Good Sam Protection Plans, simply return any Good Sam Protection Plan purchase to the store for processing. Purchases paid for with a personal check are subject to a 14-day hold period prior to being eligible for return. We're aware it can be difficult to correctly order your size from time-to-time, which is why we offer free returns on apparel and footwear! As long as the item is in new, unworn condition with all liners and tags still attached, we'll cover the shipping on getting it back to us within 90 days of the purchase date. Upon receipt, we'll issue a refund or process an exchange for the new size or color specified. Please contact our customer service team (1-800-334-6541) for a prepaid label. The following items provided they are unopened and unused, may be returned or exchanged within 30 days of purchase: augers, electronics, skateboards, bikes, software, arrest systems, canoes, ice houses, tents, waders, drones, kayaks, and tree stands. After 30 days, defective product returns or exchanges must be handled directly with the manufacturer. The following items may not be returned to the store due to legal/safety considerations: outboard motors, trolling motors, EPIRBs, boats, Spot, life rafts, PLBs, Class B AIS, items with expiration dates (such as flares and generators), customized items (such as boat covers), cut-to-length products (such as ropes and carpets), rigging, carry-on air conditioners, electronic charts, hazardous items, licenses, and gift cards. If proven defective, these products may be exchanged for a replacement of the same model and style only. Any items returned as part of a promotional discount will be prorated and the value of the discount, free product, or gift card will be deducted from the reimbursement. Items received as part of a free gift promotion cannot be exchanged unless damaged or defective and for a direct replacement only. Gift cards cannot be exchanged for cash or applied to a previous purchase. Our Open Box Outlet features products that have been opened and returned, display items, and merchandise that was simply used for photography. These items may have minor cosmetic imperfections that will not affect performance and, in some cases, are not noticeable. These products are non-returnable and non-refundable unless an error has been made on our part in describing them. Good Sam Club Members save up to 10% every day at Overtons.com. All membership pricing and additional membership coupon savings are applicable to Good Sam Club Members only. Savings are reflected in the cart during checkout with a valid Good Sam Club membership number or by adding the Good Sam Club membership to the cart. Excludes merchandise from the following brands: Hyperlite, HO, O’Brien, Barefoot International, Mission, North Sports, O’Neill, Revel Match, Ronix, Connelly, Liquid Force, Roswell Wake Air, and select electronics. At Overton's, we want to make sure you're getting the best products at the best value which is why we offer the lowest prices possible. In the event you find a lower price somewhere else, let us know and we'll price match it. Don't be shy! If you should find a lower price at the time of your purchase or within 30 days after the purchase date on an identical in-stock item, just mention where you saw the lower price and we'll match it. Contact our customer service team (1-800-334-6541) or visit your local store. Provide us with the competitor’s name, item, price, and location of where you saw the advertised price. We'll confirm the lower price then match it! Easy enough, right? This offer applies to all in-stock merchandise. We aren’t able to sell products below our cost and reserve the right to make final judgment calls on all price matches. Special orders, rebates, financing offers, gift with purchase offers, services, misprints, or prices on special buys, discontinued, clearance, closeout, used, damaged, returned, refurbished, open box, display merchandise, or items with MAP pricing. Competitor's or hourly sales (such as a holiday “5-hour sale”), one-day sales, After Thanksgiving Event sales, Cyber Week, credit or loyalty promotions. Online only retailers, dealers, and/or resellers are not eligible. If we offer an item at a lower price within 30 days of your purchase, we will refund the difference in price to your original form of payment, unless the offer or items are noted that pricing does not apply to previously purchased merchandise. A receipt or proof of purchase must be provided to receive a price match after the time of purchase. This policy does not apply to competitor's or hourly sales (such as a holiday "5-hour sale"), one-day sales, After Thanksgiving Event sales, Cyber Week, credit or loyalty promotions. Good Sam Club Member pricing and coupon savings are applicable to Good Sam Club Members only. Some exclusions apply, click here for details. How to measure for that perfect fit? Head – Holding the tape in place just above the brow, measure around the largest part of the head. For fitted hats, measure the circumference of your head at the place where you would wear a hat, and use the sizing chart to determine the proper size. Neck – Find a shirt collar that fits comfortably. Lay the collar flat and measure from the center of the collar button to the far end of the opposite buttonhole. Chest/Bust –Holding tape firm and level, measure chest just beneath the arms and across the shoulder blades. For bust, measure at the fullest point of the bust and over the shoulder blades. Sleeves – With arm relaxed at your side and slightly bent, measure from center back at the base of the neck, over the point of the shoulder, and down the outside of the arm to the wrist. Waist – Keeping one finger between the tape and the body, measure around the natural waistline. Order belts the same size as your pants waist size. For in-between sizes, order the next size up. Seat/Hips – While standing, measure around the fullest point of the seat. Inseam – Find pants that fit comfortably. Lay them flat, with creases smoothed in the front and back. Measure along the inseam from the crotch to the bottom of the leg hem. Men's regular inseams measure 32"; tall inseams measure 34". Hand (For Gloves) – To measure knuckle circumference, keep your hand flat and measure around your large knuckles. Do not include your thumb. To measure hand length, measure from the base of your palm to the end of your middle finger. Circumference (For Footwear) – The measurement around the inside of the boot at the largest part on the upper calf. Shaft (For Footwear) – The height of the shaft measured from the middle of the arch up the outsole of the boot to the top of the boot shaft in inches. Men's Footwear Sizing – To measure your foot, CLICK HERE to download our printable foot measurement tool. Shoe size conversions vary by manufacturer. Items may not be offered in all sizes. Women's Footwear Sizing – To measure your foot, CLICK HERE to download our printable foot measurement tool. Shoe size conversions vary by manufacturer. Items may not be offered in all sizes. Youth Footwear Sizing – To measure your foot, CLICK HERE to download our printable foot measurement tool. Shoe size conversions vary by manufacturer. Items may not be offered in all sizes. Overton's cares about you and your family and we're committed to your safety. Help keep your family safe by checking product recalls and safety news from the U.S. Consumer Product Safety Commission. Recall information is also available at recalls.gov. From small grocery carts to virtual online carts, Overton's has grown over the years and proudly accepts the title of the World's Largest Watersports and Marine Accessories Dealer. Launched in Greenville, NC in 1976, the company that sold waterskis out of a local grocery store now provides an expanded selection of over 100,000 products worldwide. We offer the best products at the best value to ensure you have everything you need to get on the water. We are proud to be part of the Camping World family of brands with other reputable organizations like Good Sam and Gander Outdoors. These great partners help us to provide you with a wide scope of outdoor adventures, experiences, and gear to help you get outdoors faster and on the water longer. Click here to view our current job listings. Camping World Holdings, headquartered in Lincolnshire, Illinois, is the leading outdoor and camping retailer, offering an extensive assortment of recreational vehicles for sale, RV and camping gear, RV maintenance and repair and the industry’s broadest and deepest range of services, protection plans, products, and resources. Since the Company's founding in 1966, Camping World has grown to become one of the most well-known destinations for everything RV, with over 135 retail locations in 36 states and comprehensive e-commerce platform. Coupled with an unsurpassed portfolio of industry-leading brands including Gander Outdoors, Good Sam, Overton's, The House and Windward/W82, Camping World Holdings has become synonymous with outdoor experiences. Camping World's stock is traded on the New York Stock Exchange under the symbol "CWH." Yes! Overton's currently ships products around the world to over 150 countries. We accept international orders by mail, phone, fax, email, and over the web. All international orders must be prepaid in US currency. Some items may indicate they can only be shipped to addresses within the United States as certain items may not be allowed to be exported. This could be a result of the hazardous nature of the particular product or due to restrictions imposed by the manufacturer. How much is shipping & handling for international orders? These areas require a special handling fee of $10 plus actual shipping charges based on the weight and dimensions of the package(s). For Canadian and International customers, the shipping charge at checkout is an estimate; you will be contacted by our International department with an exact quote once the order has been submitted. Any applicable duties, taxes, customs charges, and brokerage fees are the responsibility of the customer. What are my payment options when placing an international order? We accept payment via credit/debit card, bank wire transfer, check, or money order. To complete payment with a check or money order, please contact us to receive the complete total before sending your payment. Please click here to download the details. Please click here to download the detail. Overton's currently sponsors several national and regional organizations that benefit our customers in a variety of ways. We take great pride in giving back to the communities where we do business, however, all requests cannot be granted. Due to the enormous volume of requests, we will only contact individuals if their requests will be filled. Please know that all donation requests are given serious consideration. We wish all organizations success in their endeavors. At Overton's (the "Company") we are committed to accessibility, diversity and inclusion. We believe all of our customers, consumers and staff should be able to have equal and effective access to our core websites and other public-facing digital communication. In doing so, the Company has a goal to comply with applicable accessibility regulations including the Americans with Disabilities Act (ADA). Our target accessibility standard is the World Wide Web Consortium (W3C) Web Content Accessibility Guidelines (WCAG) 2.0 Level A and Level AA. To meet this standard, we have dedicated resources to our digital accessibility compliance effort, including those who coordinate the effort, and those responsible for designing, developing and testing our core website, smartphone apps, websites, chat and digital content. We also work to ensure that our support documentation and services meet accessibility requirements. We collaborate with industry partners and vendors to identify areas that need improvement. Phone: Contact our team by phone by calling (800) 334-6541. For deaf or hard-of-hearing telephone, dial 711 to connect to the Telecommunications Relay Service (TRS).